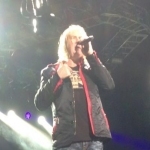 Def Leppard and KISS continued the Summer Tour 2014 last night in Cleveland, OH with a 14 song set played. The band played the regular 75 minute set at Blossom Music Center. The show started with the live snippet of 'Won't Get Fooled Again'. The rest of the show was the usual set with no changes from Pittsburgh. Phil used his Bela Lugosi guitar for this show which is being displayed at the Rock And Roll Hall Of Fame in the city. The museum lent him the guitar especially for this show as explained in this interview from July. The next show takes place on 28th August in St. Louis.